Elena Gadjanova writes a fascinating account of her fieldwork in Northern Ghana, finding that while vote buying strategies were normalised, they were not enough to determine the results of elections. Instead voters were likely to cite programmatic concerns as shaping their decisions at the ballot box. Widespread vote-buying is commonly seen as a major obstacle to democracy, good governance and political accountability in Africa. Where the predominant mode of politics is clientelistic and politicians rely on extensive patronage networks for votes, there are few incentives to provide public goods or pressures to deliver on development promises. However, to be effective, clientelistic bargains need to be reciprocal and enforceable: vote-buying works best where inequality is high, information on politics and performance is low, and ballots are closely monitored. But what if voting is secret and candidates’ records are known to constituents? And what if there is a viable political alternative so voters have a real choice? To better understand the effects of campaign handouts in competitive elections, I studied voting and candidate behaviour in two rural constituencies in Northern Ghana (Nabdam and Chiana-Paga). The two constituencies had voted incumbent MPs out twice, once in 2008, and again in 2012 in very tight races. Because poverty in this area is very high and elections were competitive, the two constituencies were places where handouts could be expected to persuade voters to back one candidate over others. Given also that Ghana’s two main parties – the National Democratic Congress (NDC) and the New Patriotic Party (NPP) are evenly matched in terms of resources and local networks – one could further expect competitive vote-buying and little attention to MPs’ past performance or substantive debate on platforms or policies during the campaigns. What I found instead was that campaign handouts were indeed widespread, normalized and expected. 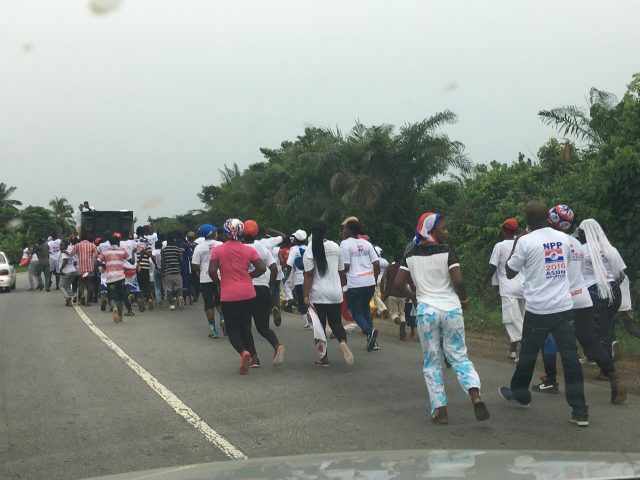 However – by the accounts of virtually all political operatives and party strategists I spoke to locally and in Accra – utterly futile in guaranteeing votes. This was because all sides gave out cash during the campaigns, ballots were secret, and the opposition (especially Ghana’s smaller parties) had coached voters to take what they could get but ‘vote their conscience’. And so the material rewards provided at rallies and walkabouts – cash, food, drinks, t-shirts, bicycles, sewing machines – were seen as ‘gifts’, not bribes. Voters were candid about taking as many gifts as possible by attending multiple campaign events; they felt entitled to them and resentful if they had not received any. Crucially, party officials were aware of this ‘gift shopping’ and were largely resigned about it. So what mattered most to voters? Survey respondents widely cited MPs’ past performance and ability to ‘bring development’ as most important. A large number of voters had taken incumbents’ gifts but switched support to a competitor over what they perceived as arrogance, neglect, failure to address pressing concerns, and failure to develop the area. Moreover, despite being remote and rural, these were not ‘information poor environments’: people closely followed the election, attended rallies and campaign stops, were aware of candidates’ past records and parties’ different local policies, and had clear preferences and expectations. The larger puzzle was that if vote-buying was widely recognized as ineffective, why did it carry on at such a large scale? Here, it is important to consider the broader significance of public displays of wealth during elections in Africa, particularly in rural areas. An extensive literature equates wealth and the willingness and ability to give gifts with success, authority, and legitimacy in Sub-Saharan Africa (Bayart 1978; Chabal and Daloz 1999; Nugent 2007). Sharing wealth is a sign of civic virtue so not giving gifts would signal lack of empathy and morality, and be equated with selfishness, greed, even witchcraft (Austen 1993). This electoral economy of affection, in which gift-giving is seen as a sign of empathy and respect, explains why the practice persists despite acknowledgement of its futility and why candidates cannot agree to not give gifts altogether. Given also the central role gifts played in guaranteeing the consent of the governed during the colonial period and the single-party era in Sub-Saharan Africa, newcomers do not face a clean slate. Aspiring politicians must first establish their status by gift-giving, and then constantly reaffirm it. In the multi-party era such displays are a necessary, but insufficient condition for victory: to win, candidates must also perform well in office and demonstrate ability to bring development to their area. Moreover, when candidates give gifts but do not perform well, their records in office are a stronger signal of ability. Parties are therefore forced to differentiate in other ways. I find nascent programmatic competition even in settings where poverty is high and vote-buying is expected to be most effective. Seeing electoral hand-outs as status-affirmative and not as vote-buying per se is one way to reconcile the ubiquity of campaign clientelism in Sub-Saharan Africa with findings that voters consider candidate performance and party ideology when deciding who to support. The larger point is that when material inducements are insufficient to guarantee a win, parties must find other ways to persuade voters. One possible strategy is to target constituencies with policy proposals. In Northern Ghana, such policy proposals were extended to farmers and the youth and were effective in winning votes. Nevertheless, such status-affirmative campaign clientelism creates incentives for politicians to extract rents locally or from the state to recover expenses. The practice reinforces the need to accumulate and parade personal wealth. Public institutions are viewed as vehicles for enrichment, while a lack of a public service ethic among civil servants continues. Further, the majority of parties in Africa remain weak, fragmented, disorganized, and personality-centered. Faced with pressures to pursue other linkages to voters in light of the diminished effectiveness of clientelism and its exploding costs, candidates may engage in charismatic appeals, morality politics, vote-rigging, or violence and intimidation. Which of these strategies politicians choose to pursue is of great significance for the quality of democracy on the continent. 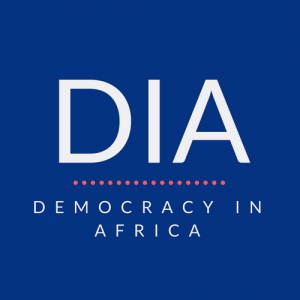 This blog post is based on the article “Electoral Clientelism as Status Affirmation in Africa: Evidence from Ghana”, recently published in the Journal of Modern African Studies. The research was supported by the Max Planck Institute for the Study of Religious and Ethnic Diversity. Elena Gadjanova is a Departmental Lecturer at the Blavatnik School of Government, Oxford University and a research associate at the Max Planck Institute for the Study of Religious and Ethnic Diversity.